A group of 4 professional singers (soprano, alto, tenor and bass) offering accapella songs performed in 4 part harmony. We are also available as a trio or a group of 8. All singers are university qualified in music majoring in classical voice. Their experience and professionalism guarantee you the highest standard of performance reliability. No fussy equipment: they arrive, entertain your guests, then leave. There’s nothing like live music sung with beautiful harmonies to make your event unforgettable. 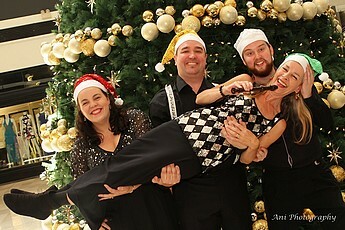 Performers can dress in smart casual/formal black with sparkly Santa hats or hints of red and green. The mobility and flexibility of the carol singing quartet allows them to roam amongst guests, sing by the Christmas tree enchanting guests as they come and go or perform a 'Carols by Candelight' stage concert. Our Christmas carollers are entertaining, heart warming, will delight any audience and really bring the spirit of Christmas alive.